Scooby-Doo is on the rescue mission. But the place is creepy and he has to pass the terrifying corridors full of ghosts and sudden sounds. 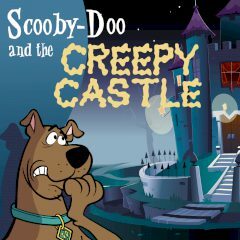 The castle your fiends are in is full of ghosts and is creepy enough for humans to stay away from it. But you are a dog and you love your friends. Think ghost won't harm you because they have no body? Maybe you are right, but will you dare to enter the castle and walk among them? This is the chance to test your bravery.